Have you found an online vendor selling Foursquare 9-Year Port Cask Finish? I am a big fan of the "Exceptional Cask Selection" releases from Foursqure and Mr. Seale. At sub-$40, this port barrel-finished rum is the best value of the bunch. It does require a few minutes in the glass to breathe and open up, but once it does, it is beautifully balanced. Naturally balanced sweetness, with the slightest hint of port on the nose and palate. Very deep... pour this into a proper glass and get lost in the nose. My biggest complaint is the meager 80 proof (c'mon, Rich! Though I guess I could blend with some 2004...). Still, a tremendous value for a world-class rum! 9-, 9 (former rating: 8+). If it were 45%+, 9+. Nose: Rum, real and proper rum. Some light toffee and vanilla, slightly grassy and dry with some buzzing oaky notes coming through. Under the heavy-weight rum and bourbon notes the port starts to come out to play and then the depth of this rum starts to show itself; dark berries, plums and black cherry. Rich dark chocolate liquors of some type., light fruity coffee (something like a Kenyan Peaberry), and some good spices – cinnamon, cloves, black pepper. The faintest suggestion of banana off in the distance too. Beautiful and really well balanced, the nose is delivered in layers without one aspect pushing it’s way through for dominance. Palate: Well the nose was pretty good, lets see what the palate has to offer. Medium mouth-feel, dry, good level of coating. Dry. Oak, dry. The flavours jump straight out, it’s quite a big flavour despite the low abv; follows the nature of the nose with bourbon cask first showing plenty of caramel and vanilla on the first sip but the port shows up sooner than on the nose and leads with under-ripe plums, black grapes and dates/prunes. Dry. After a few sips more starts to become available with some dark and bitter black chocolate, black coffee, nutmeg, and some black pepper. Finish: Long. Dry. As the palate moves to the finish there is loads of fresh ground black pepper and cinnamon, it’s mouth puckering and slightly bitter (in a good way). There are some vague and suggested dark fruits on the finish but it’s mostly drying, bitter oaky chocolate that slowly drifts off as the finish fades. 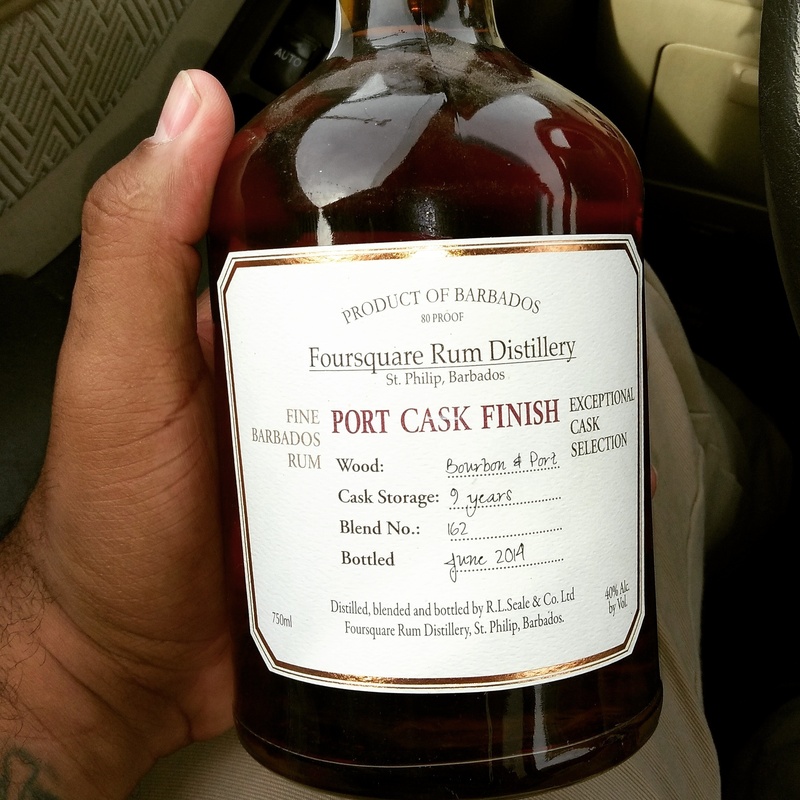 Foursquare distilleries in the South-East of Barbados does a fantastic line in single cask aged unadulterated rums. Not blended, not from a solera, not sweetened, but given its own character from the treatment usually expected from a single malt whisky, and in this case - ageing in Bourbon and Port casks for 9 years. The bottle is a bit disappointing - it is the standard bottle also used for a lot of the Doorly's with a cheap screw top. In the glass the rum is a deep amber with a big, smooth aroma. None of the smokiness of the Doorly's XO, but with a deep warm port note, that carries all the way through. In the mouth it is exceptionally smooth, with the raisin and fig notes given extra depth by the port finish. it is a dry rum without vanilla notes. Finish is a gentle burn with the aroma lingering really well. This is the kind of carefully crafted quality, that is turning me away from my entry favourites of Zacapa and Plantation, which focus on consistency by blending and appeal by adding sugar. This stuff is inconsistently gorgeous! I usually rate rums about a point below their consensus rating, because I've tried so many high quality rums. And I generally don't care that much for rums that are aged too much in bourbon, whiskey, and other such barrels. A lot of reviewers said this one had too much port aging. I respectfully disagree. Smells and tastes of brown sugar, molasses, oak, vanilla, spice (cinnamon and nutmeg), with a little port, and just a very light touch of bourbon and pepper. Has a nice sweetness that is not overly sweet. At only $31.99 (Total Wines 2016), this rum is an absolute bargain. I am really impressed by this rum; I rate it a high 9. Beautiful bronze reddish colour in the glass. The second maturation in the port cask the aromas ore not overpowering. Overall nicely balanced with a more fruity type notes coming up front. Taste is a bit light for a bajan rum but again is nicely balanced with fruity notes leading into more dark fruits, caramel, spice with plenty of tannins. Nice creamy mouthfeel. A nice sweetish dry finish. Another great rum from Foursquare and wish I had bought another bottle. Let me say this beforehand...I am indeed biased at the outset since I am a fan of Richard Seale's lineup of rums. I also have a huge amount of respect for the man due to his philosophy of being open and upfront about his product. No double-speak. No smoke-and-mirrors. No malarky. A beautiful amber hue with bronze on the edges. It has exceptional legs in my snifter. The rum slowly drifting down the sides in unbroken rivulets. The aroma is enticing and tickles my nose with some pepperiness. Oh, and the flavor! Noticeable vanilla, caramel, and toffee with a peppery bite along with some tannin bitterness. There seems to be a little cinnamon in there as well (maybe I am imagining that). A little burn which fades rather quickly. It is a little dry. There is a natural sweetness to it from the port cask but not at all overwhelming. No sugaring. None. Nada. Any sweetness comes naturally from the sugar cane molasses and the woods in the barrels and casks. This is a true rum lover's sipping rum. Any other company would charge close to $100 or more for something like this but I got mine for under $40. I was extremely surprised to find it locally since Foursquare products...in fact, any of Seale's rums...have ever been sold locally. I bought extra bottle in case the local availability was a fluke. I hope that the local stores might carry more of the Seale line of rums. In short, this is arguably the best sipping rum in my collection and one I wholeheartedly endorse. Seek this one out, folks. This is what rum should always be. Sugar: Estimated 4 GPL. Another classic rum from the Foursquare masters. The first thing I noticed was the screw top bottle that has been dipped in wax. This rum is worthy of a proper cork. Second thing, is you need to let this rum catch some air. It's a bit sharp on the nose, so give it a swirl and wait a minute. As expected after 6 years in a Port cask the rum has a nice reddish tint to it as well as a decent aroma and taste of port. Underneath the dominant port taste is a well balanced classic rum with vanilla, oak, some peppery spices (probably from aging in bourbon casks, and a touch of caramel. Nice kick and burn all the way down. Overall I find this rum to be a very good value, but I don't see this being anything higher than an 8 as it has some sharp edges to it. Wow! Not only does Richard Seale hit this out of the ballpark, but it is done with a price tag that is downright a steal! The flavor composition is wonderful. This is not a dry rum like the Richard Seale's black bottled finest rum, however, what it is is a smooth rum with nice flavors that work well together. Fruity, oaky notes that intermingle well with vanilla, clove, cinnamon, caramel and nutmeg. And make sure you have a bottle, or two put away! This rum is very limited overseas as well as here! Of the 3 Foursquare Cask offerings, the other 2 I'm aware of at least being the 2004 and the Zin, this Port finish is the sweetest. Not in a sugary way though. It seems the port tames the bourbon which in turn brings out the white oak wood with a hint of cedar. It's a lovely sipper with a kick that feels stronger than the noted 40% ABV. Perhaps it's the wood influence that is so tongue numbing. Yes if you like wood, smoke, pepper and leather. No if you like sugary candy smooth crap. You can definitely taste a bit of port from the port finish. I think it adds a nice character. The bottle is pretty cool, if a bit kitschy, with wax seal and faux handwriting. A good bargain for a good rum with reasonably complex character. This rum combines the benefits of Port and cane spirit. Its wide range of nuances in the nose goes from raisin and prune to slight chocolate and cookie all the way to tobacco and oaky notes. The main palate carries port with surrounding seales 10. The aftermath is full, slightly sweet and very satisfying. This is very good, but not exactly to my liking. Should I rate it lower for that? I don't think so. Just because I might have paid a little too much for a high end mixer, it won't be the first time. It won't stop me from trying the next Foursquare/Seale offering. They make a mean rum. Try them all, and you will easily like way more than you don't. Nice and fruity nose with vanilla, banana, chocolate and a little bit of oak. Perhaps a bit of coffee as well, as it heats up in my palm. There's a very pleasant and fresh sweetness to it. It has a nice and light texture in the mouth and an overall delicate expression, typical of many bajan rum.. The flavorful palette fits my bill with notes of juicy tropical fruits, ripe banana, vanilla and rounded oak. The finish ain't no explosion, but very nice with a lingering fruity, coffee sensation. This is exceptional value, if your into the non-sweetened, but very flavourful bajan rum's. One of my favorite styles. This little port cask experiment from mr. seale turned out just right and I do hope more of this kind is on the way. i smell coffee, dried fruit and some spice. i taste coffee too, some raisins and some grape. pepper notes, marzipan. one of the best.. a clean, light rum with a lot of flavour. dried fruit and of course the coffee note from the port aging. a good real rum to show you the taste of aging in a port wine cask! The aroma of port wine is immediately present and powerful, and so my senses were primed to taste aged port...but instead I got rum with very heavy port overtones. Now, I like port and I like rum, but not in the same glass. I don't feel that the flavors blended well to make one fine drink. Instead, there are two prominent and distinct profiles, and little harmony between them. J ai gouté ce rhum que j avais depuis longtemps.il est trés trés bon.beaucoup de gout ling en bouche tout en restant tres doux.vraiment un grand rhum.note 8.7. Close to perfection. Great flavors, mouthfeel, and finish. Nose: smells of bourbon and vanilla. Mouthfeel: dry but pleasant with almost no burn. Taste: light all around. Oaky, maybe? Bit of the standard vanilla. Just plain good. Sublimely drinkable, perfect proof, easy on the nose and not adulterated with sugar or flavoring. Truly a great rum that everyone should seek out. Most rums twice this price aren't this good. Got the privilege to get a glass in the Rumbarrel (rum-cafe in Amsterdam). It is the first in the exceptionel cask selection and it's really good. I hope there is still some left for my next visit to the Rumbarrel. S palirnou foursquare nemuzete slapnout vedle. Zatim jsem mel jen mensi ochutnavku v Cubana baru. Az nacnu celou lahev, pridam vice poznamek. Der perfekte Rum um ein Tasting zu beginnen! Perfect Rum to start a rum tasting! One of the first foursquare rums I tried. The port shines through but not in an obnoxious way. Sweet dark fruit, hints of all of your favorite baking spices and at a great price! The wax top is a nice added touch! Really light but sweet on the nose. Complex, slightly peppery on the tongue with an easy finish. Very tasty and well balanced rum with flavour dominated by sweetness from port barrels. Will sure give it another try and maybe rate higher after that.